A family heirloom recipe for hearty seafood chowder made with shrimp, clams and scallops. Do you want to hear something so stinking sweet? I was on the phone with my dad last week and he told me Mom was making her wicked awesome Shellfish Chowder for supper (well, Dad didn't actually use the terminology, wicked awesome). I told him that I needed to cook it soon so I could get some pictures and post the recipe to the blog. Because it’s All That, y’all. For reals. The next day I got several pictures from them. It was the sweetest thing. They had staged the prettiest place setting and taken pictures for me. There were some with placemats and some without; some with bread and some without, etc. Dad said they fretted over getting it just right for me. I’m gonna cry. Sauté celery and onion in butter in a large stock pot over medium heat 5 minutes. Add garlic and continue cooking for 2 minutes. Add water, potatoes, salt, pepper and bay leaves; cover and simmer for 30 minutes. Add scallops and remaining ingredients, return to a simmer and continue cooking for 5 minutes. Remove from heat and allow to rest, covered for 15-20 minutes before serving. *You can add lump crab meat as well for an extra special chowder. If you’re fortunate enough (and I have been from time to time) to have a hook-up on blue crab claws, they are a divine addition! 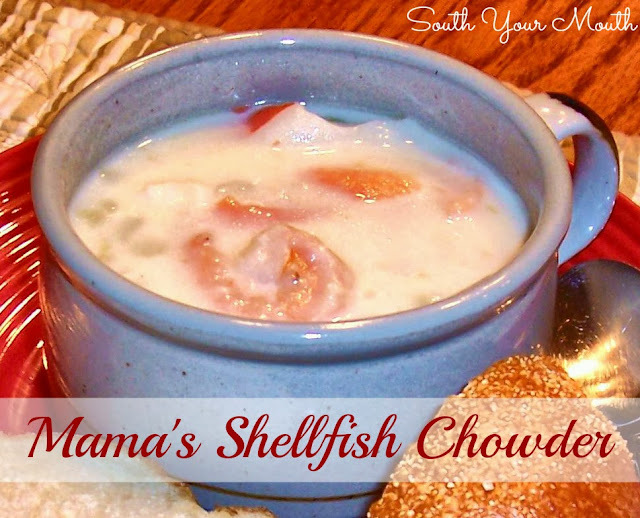 If you enjoyed this recipe also check out this recipe for Best Clam Chowder! So sweet of your parents, to go throuigh all of that for you. But that's how we parents roll, right? !I have been wanting to try a home made Chowder..looks like I have found a recipe! woo hoo..thanks! Yes they are! I was blessed with amazing parents. When I grow up, I hope I'm half as good of a parent as they are. Oh, thank you for posting this recipe. Just in time for me to go to my fishmonger so I can fix it this w/e. I had been wondering what I was going to make. Really looks good. Adding flour in with the garlic will thicken the soup, and is in fact required for something to be called a chowder. Also, adding the shrimp shells wrapped in cheesecloth and the clam juice in with the potatoes will improve the flavor. Actually, in fact, you're incorrect about the flour. But even if you were, in fact, correct, this is my mother's recipe and I love it. If she wanted to call it potpourri I'd still love it and appreciate her for both the recipe and this story. Making this tonight! Looks fantastic!